The goblet squat can be used across all fitness levels and sports to develop squat technique, muscle hypertrophy, strength, and better functional movement. 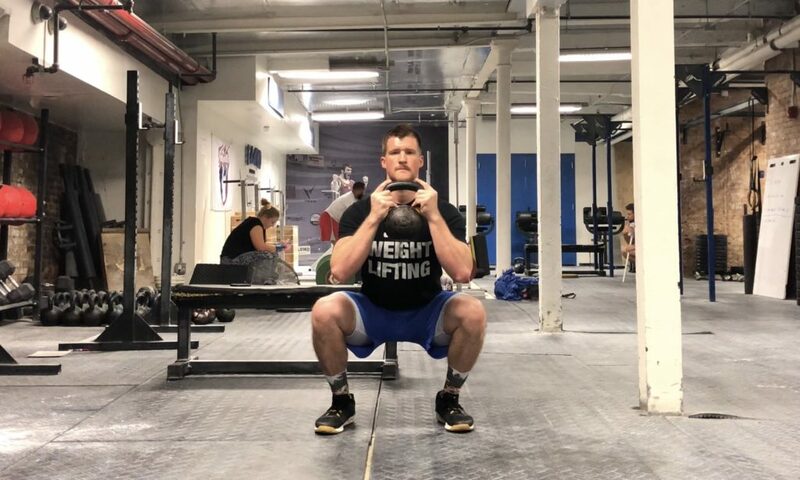 In this article, we will discuss everything beginner athletes, lifters, and coaches would ever need to know about the goblet squat. Below is a step-by-step guide on how to properly set up and perform the goblet squat. Step 1: Grab a kettlebell or dumbbell and hold it at chest level. To do this, hold a weight at chest level with the elbows under the wrists. The weight should be close to the chest with the shoulder blades together and placed down the back (scapular retraction and depression). Step 2: Set your feet in a squat stance, so that the heels are at hip width or slightly wider. With the toes forwards or slightly turned out, set the body so that the weight is not resting on the body, but rather supported by the upper back. Your abs and ribs should be pulled down and in with minimal pelvic tilt (neural lumbar spine). Step 3: To squat, sit the hips down over the heels, making sure to pull your groin down between the thighs. Often, people will cue the hips back first, however this is not correct. Instead, the knees and hips should bend freely together, at the same time. Step 4: As you descend, be sure to support the weight so that it stays above your chest line. The weight should not drift forward nor shall your torso. You need to keep the weight upwards with the upper back and arms. Any excessive forward lean will result in your hips shooting backwards, throwing off the squat. Step 5: At the bottom of the squat, you should be able to contract your back muscles to raise your chest high with the weight at that level. The knees themselves should be out over the toes. Note, that you should not simply “PUSH” the knees out, as too excessive can also be a bad thing. Instead, think about pulling the groin apart as you sit while placing the knees over your big toe. Step 6: I recommended having all beginner lifters pause at the bottom of the squat so that they can feel their body needing to resist forward flexion. This will also help to establish better stability, control, and even mobility at the bottom of the squat. Step 7: When standing up, you need to actively lift the chest and the weight so that they both stay slightly higher than chest height. It is imperative the the hips do not shoot backwards. Too often athletes and coaches will allow the hip to shoot up and back, rather than keeping the torso upright and placing the majority of the movement on the quadriceps. By allowing the hips to shoot up and back, the lifter can cheat the squat movement and load more of the hamstrings and lower back. The goblet squat is a squat variation that can be done with a dumbbell or kettlebell being held in front of the body at chest height. This squat variation is often done as a fundamental squat exercise with common progression like the barbell, front, and overhead squat. In addition, this squat variation can be used as a educational exercise to help new lifters (and lifters with limited body control and squatting experience) establish better balance, positional awareness, and basic squat strength. The goblet squat, like most squat movements, targets the lower body, core, and back. The below muscle groups are primary worked by the goblet squat. The goblet squat targets the lower body as a whole, but due to the placement of the load (in front of the body) the lifter must maintain a more upright torso positioning, reinforcing greater knee flexion. In doing so, the quadriceps are asked to support the movement at a higher degree. Like most squats, the glutes are used to assist in the extension of the hips at the top of the movement as well as stability and strength in the squat itself. The scapular stabilizers/upper back muscles must work to resist spinal flexion caused by the front loaded kettlebell/dumbbell. In doing so, the scapular stabilizers work to stay retracted and stable, which is necessary for more advanced squatting movements. Below are four (4) benefits of the goblet squat. 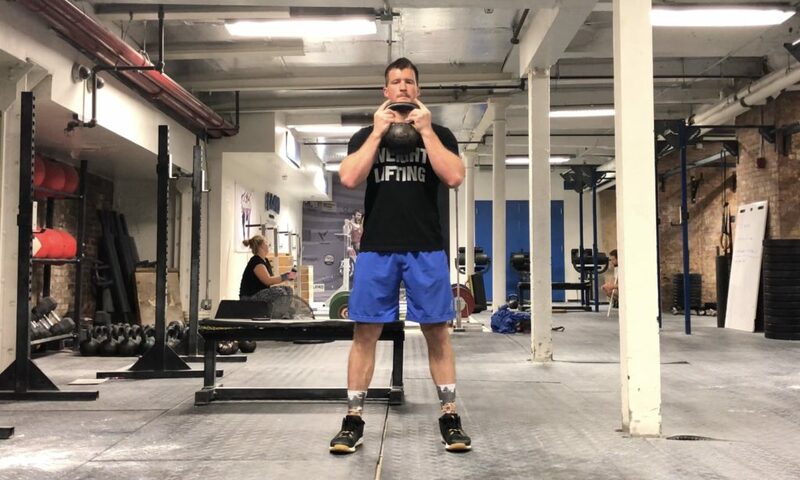 The goblet squat will help establish better balance and stability in the bottom of the squat primarily due to the lifter having the ability to use the weight as a counterbalance in the squat. This will also help to reinforce proper body positioning in the descent and deepest squat positions. This front loaded squat exercise can help to target the quadriceps. By having the weight supported in front, the lifter is often forced to remain in a more upright torso position (similar( to a front squat). Establishing better squat balance, stability, and positional strength can all be developed using the goblet squat for most squatters. The goblet squat can be a helpful squat regression for beginners looking to establish greater squat strength, control, and awareness. This can be helpful for lifters who may have stability or movement control in more advanced squat versions like the front or back squat. We break down who can benefit from goblet squats, and why. 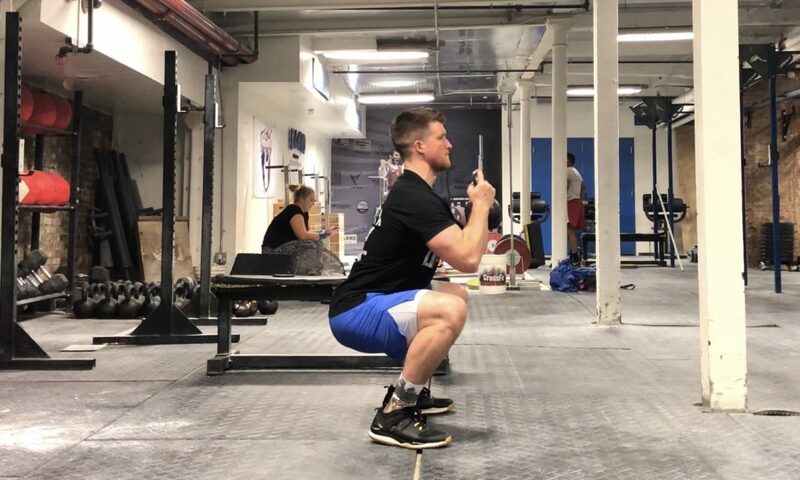 The goblet squat can be used to develop better greater squat mobility and positional strength in either assistance exercises or warm up/corrective segments. Seeing that it is a foundational squat movement, it can also help to teach better alignment in the squat movement. In addition to the benefits above, competitive fitness and CrossFit athletes will benefit from training goblet squats to do them often being seen competitive WODs. Goblet squats are a good movement for runners and other endurance athletes who need to target the upper back muscles and quadriceps in a higher rep fashion. The goblet squat is fundamental movement for most beginners and is often easier to grasp than a barbell back squat. The above benefits also apply here as a beginner transitions into a more intermediate and advanced lifter. Below are common set and rep schemes to develop movement, hypertrophy, strength, and muscle endurance in the goblet squat. The goblet squat is a foundational squat exercise that can help beginners understand body positioning and develop greater balance and stability in the squat. The goblet squat is a good way to build muscle hypertrophy in the quadriceps using moderate weight with moderate to high volumes. The goblet squat can be used to build strength (with heavier kettlebells) by simply using the sets and rep ranges below. The goblet squat can be trained in higher rep ranges and volumes to increase muscle endurance and stamina using the rep and set ranges below. Below are three (3) goblet squat variations coaches can use to progress this exercise on most training programs. Pause goblet squats are a great way to increase concentric strength, and positional strength in the squat. Lifters who have issues collapsing in the bottom of the squat and/of they find they cannot maintain rigidity in squat can benefit from this exercise. 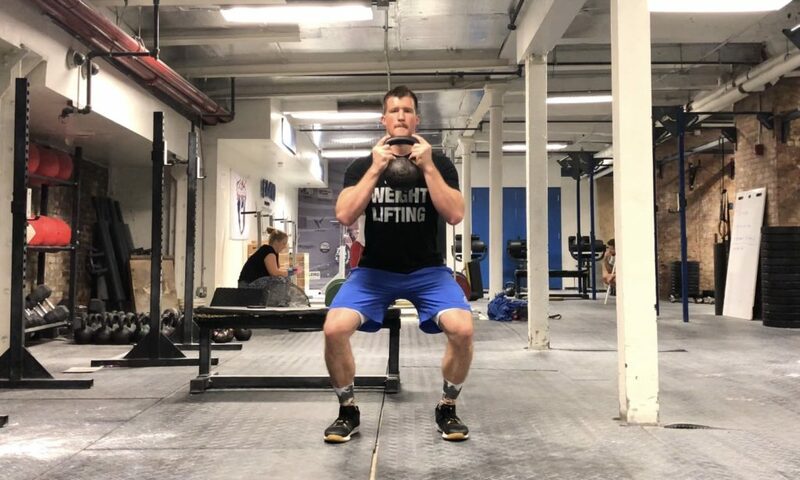 By performing a goblet squat with the kettlebell raised at shoulder height (with straight arms) the lifter can help to counterbalance themselves as the try to find better squat balance and activity. This goblet squat variation can be done to increase a lifter’s stability and control at the bottom of the squat. To do this, the lifter can perform a goblet squat, and pause at the bottom. In the pause, the lifter will perform a kettlebell curl (holding the kettlebell with both hands), finishing the curl while still seated in the pause squat. Once done, they can assume the standing position and repeat. Below are three (3) squat exercises that can be great alternatives for the goblet squat. The double kettlebell squat is very similar to the goblet squat in that in stresses many of the same muscle groups and proper torso positioning (vertical) as the goblet squat. By using double kettlebells you can challenge total body control and upper back strength on an isolateral basis. The front squat is a viable alternative to the goblet squat, as it targets many of the same muscle groups. The quadriceps, anterior core, and back muscles are primarily targeted by both be front squat and the goblet squat. The tempo back squat can be done to increase quadriceps engagement to induce greater muscle hypertrophy. In addition, lifters can perform tempo back squats to improved balance and stability throughout all ranges of motion in the squat. More Goblet Squats and Kettlebells! Take a look at some of our goblet squat articles, as well as these great kettlebell training secrets! Have You Ever Tried This Insanely Challenging Metabolic Movement?